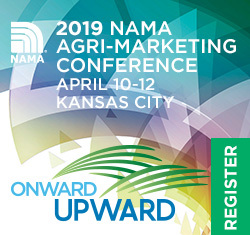 Congratulations to Jeff Smith, Farm Progress, for winning a free 2019 Agri-Marketing Conference registration from NAMA! The names of members who referred new NAMA members between October 15 and December 15 were included in a drawing that took place on December 17. Jeff was the lucky recipient whose name was drawn. Thanks to everyone who participated for their referrals! Get ready to soar “Onward and Upward” at the 2019 Agri-Marketing Conference! 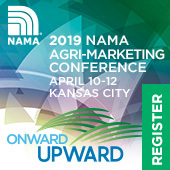 Check out the exceptional breakout sessions we have lined up and make plans to join NAMA in Kansas City, April 10-12, 2019. Find out more information on the Conference website. What can large brands teach small start-ups? Bonin Bough will share his experiences working with small businesses as the host of CNBC’s “Cleveland Hustles,” the hit show created by NBA superstar LeBron James and Maverick Carter, James’ business partner. Find out the real stories behind the businesses featured on the show and hear valuable lessons you can take from the entrepreneurs who competed for investments and the executives who coached them. Come and let Bough, a 2013 inductee of the Advertising Hall of Fame, inspire you to apply growth-hacking techniques from “Cleveland Hustles” to your own work. His insights will fuel ideas so you and your marketing can rise to the top. Guy Fish is the Founder of Ursa Major, a marketing strategy agency. He has led customer experience exploration, product launches, cross-cultural planning and technology platform strategy for clients like Bayer, MasterCard and FedEx. In sharing his experience with large agencies and international companies, as well as his expertise in behavioral economics and communications planning, he’ll help you craft powerful stories that can get your brand where it needs to be. The marketing budget is often the first thing cut when times are tough. That’s a reality faced by many ag marketers, especially given the current state of the ag economy. But it’s not as easy as just cutting media dollars. In truth, it affects all elements of marketing from advertising to digital to PR and everything in between – no matter if you are an agribusiness, agency, media publisher or nonprofit. Maybe you’re dealing with this situation for the first time or maybe you’ve been down this road before and it never seems to get better. Wherever you find yourself, it is time to reassess your objectives, strategies and measurements of success. You will hear from three experienced ag marketers who have fought budget battles and lived to tell the tale. They will share how to make the most of your budget and succeed during a tight ag economy. There is very real magic in the ability to communicate at extraordinary levels. It allows people to shift mindsets, close deals, build relationship bridges, overcome objections and connect in ways that foster leadership, teamwork and exponential growth. In this non-conventional, no-box-at-all workshop, Keynote Speaker Vinh Giang will pull back the curtain and show you how to be that kind of captivating communicator. With years of innovative study in theatre, arts and speaking, Giang shares lessons that go beyond just learning to communicate with each other as human beings. He will offer you tools, skills and strategies to build and strengthen self-confidence, put fear in the rear-view, flow with clarity in your words, deliver with authority and rise above the noise of the crowd to stand out as a leader. Embark on a journey of transformation for yourself and your team and discover the secrets to magical messaging. 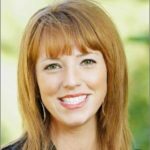 With more than 15 years of experience supporting Fortune 500 companies, Thomas will use her expertise in talent acquisition, performance management and leadership development to shine a light on trends that can help illuminate your path to success. It’s not easy to navigate the ever-evolving world of digital marketing. Let industry experts guide you through some of today’s most significant trends including UX, retargeting, chatbots and marketing automation. You’ll also get tips for assessing the value of digital marketing efforts and finding ROI in the digital space. The demands on global agriculture are increasing every day. The growing population, input costs, sustainability and food production challenges continue to make meeting current needs and planning for the future more complex. As people feel overwhelmed, can new technology step in to help? In this session, Cyndee Smiley of John Deere will present a case study showing how the company is creating technology and utilizing artificial intelligence (AI) to maximize crop yields, better food production and farm more efficiently. By reducing input costs with AI, they are finding ways to do what humans can’t on their own. Get insights from John Deere’s AI experience and learn how all this is communicated to the ag industry, the tech industry and the farmer. Come ready to understand the future of ag so you’re prepared for the future of agri-marketing. The brands experiencing the greatest success online have a strong content strategy. This session will teach you how to best create, curate and use content like blog articles and videos to enhance search engine optimization, keep visitors on your website longer and drive more sales. As President and Co-Founder of Blue Compass, Drew Harden has grown the company from a two-person start-up to Iowa’s largest digital marketing agency. Learn from his work leading digital projects for clients like Spalding Sports Equipment, NAPA Auto Parts and the NFL. You’ll gain an understanding of how to establish a solid content marketing strategy, make web pages more attractive to search engines and boost engagement on Facebook and other social platforms using quality content. There are trends in our society that are bigger than one industry, and staying ahead of them will be critical for your future success in ag. The Association of Equipment Manufacturers (AEM) has partnered with a number of leading research firms to examine these trends and their impact on the agriculture industry. Come to this presentation ready to hear about four major areas of impact that will likely have the biggest effect on our industry in North America. Join Curt Blades of AEM and Doug Griffin of ag consulting firm Context Network for a look at a collection of commissioned research along with key original insights from executives and leaders from several global equipment companies. They will give you a better understanding of where we are and where we’re going to help you and your marketing find the right trajectory for moving forward. Visit the NAMA calendar frequently for updated information and links. If you have any questions, please call us at (913) 491-6500. NAMA provides several opportunities for professional recognition. Do you have a candidate in mind for one, or all, of these awards? Go ahead and nominate someone today! January 18, 2019 is the nomination deadline for the following awards. These awards will be presented at the 2019 Agri-Marketing Conference in Kansas City! The Ag Association Leader of the Year award recognizes outstanding achievement in an association or commodity organization. The Agribusiness Leader of the Year award recognizes leadership achievement in agriculture and the food and fiber industry. This award attracts agribusiness leaders and leaders in private, public or academic service. NAMA will recognize its active members with senior management of marketing and/or sales responsibilities with the NAMA Marketer of the Year award. This award is the most prestigious honor awarded to an active member of the association and honors outstanding accomplishments in the field of agri-marketing. To thrive in the future, the NAMA community needs to develop and support the next generation of members. NAMA’s Next Gen Award honors active NAMA members under 35 years of age that show great potential in the industry. Osborn Barr set out to better understand how the next generation views farming/ranching and capture a glimpse into where the future of agriculture is headed. You’ll walk through this initial qualitative research that begins to analyze the gap in attitudes, perceptions and intentions between “Gen Z” (Generation Z 18-to 22-years-olds with an immediate family member farming operation) and “BoomXY” (Baby Boomer, Generation X and millennial farmers age 28 to 74). As the next generation of farmers/ranchers prepares to take over, there are many challenges and opportunities on the horizon for the agriculture industry. Friday is your last chance to bid on items in the NAMA Foundation Auction. The deadline to submit your bids is December 21, 2018. Proceeds from the Online Auction Support Student NAMA and the future of agri-marketing. Click here to view the packages and start bidding! For questions, call the NAMA office at (913) 491-6500 or email Sherry Pfaff. The Online Auction is available online through the NAMA website. Click here to view the packages and start bidding! Please join MoKan NAMA during this season of giving and thanks, as they spend a couple of hours towards a worthy cause. Did you know, in the KC area, 353,380 people are food insecure and missing an estimated 60.3 million meals annually? Of those, children are often among those most in need of food. Last year, Harvesters distributed more than 47 million meals to hungry people in the KC region. MoKan NAMA participants will be sorting and packing food ahead of the holiday rush. Please RSVP by December 18. The NAMA Job Network has moved to the Members Only Section of the NAMA web site. Click here to visit the website and login. Once logged in click on the Member Dashboard link at the top right and then you can choose to post a job or view job listings. If you are not a NAMA member but would like to have a job posted to our site, please email Lauren Giarratano with the job details. Are you looking to start a new position in agri-marketing? Check out the list of available jobs on the NAMA Job Network. Click here to view the current list of jobs. You will need to log into the NAMA website, as this is located in the Member’s Only Section. Once logged in, click on Job Postings. Are you needing to hire someone new? You can also post relevant jobs to the NAMA Job Network to speed up your hiring process. Click here to post your company’s position. Again, you will need to log into the NAMA website to post a job. Once logged in, click on Post a Job. Find out everything you need to know about the upcoming conference on the website! Check back often for updates on speakers, breakout sessions, the MoKan Taste of KC Tour and much more!